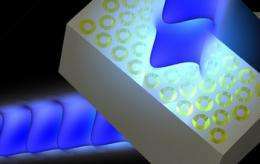 (PhysOrg.com) -- A new class of artificial materials called metamaterials -- which derive their properties from carefully engineered, nanostructured building blocks rather than from their chemical composition -- may one day be used to create ultrapowerful microscopes, advanced sensors, improved solar cells, computers that use light instead of electronic signals to process information, and even an invisibility cloak. In a Perspectives piece in this week's issue of the journal Science, Caltech's Harry Atwater and Purdue University colleague Alexandra Boltasseva describe advances in a particular subtype of these materialsplasmonic metamaterials. They also describe two of the major limitations in the field: the loss of light or, rather, its absorption by metals such as silver and gold, which are contained in the metamaterial; and difficulties in precisely tuning the materials so they bend incoming light to the required index of refraction. In their article, Atwater and Boltasseva suggest new approaches to overcoming these obstacles by replacing the silver and gold in the metamaterials with semiconductors made more metallic by the addition of metallic impurities, or by adding non-metallic elements to metals, making them less metallic. Examples of these "intermetallic materials" include aluminum oxides and titanium nitride. Some of the new metamaterials, the researchers say, are showing promise in uses involving near-infrared light, the range of the spectrum critical for telecommunications and fiber optics. Other materialssuch as the negative-index metamaterial developed by Atwater and Caltech graduate student Stanley Burgos and described in an April 2010 Nature Materials articlemight even work with light in the visible range of the spectrum. Future photonics technologies will revolve around new types of optical transistors, switches, and data processors, Atwater and Boltasseva note. Indeed, as they point out in the article's abstract, "these materials can be tailored for almost any application because of their extraordinary response to electromagnetic, acoustic, and thermal waves that transcends the properties of natural materials."